Muscles for The Ballroom. Fitness Training in Dancesport. Shoulders and Arms. Almost a trademark of ballroom dancers is the way they hold their arms creating a frame as beautiful and large as possible. It is an essential part of the posture which aims at acchieving stability and allows the more subtle forms of communication between the dancers. is part of the ballroom dancer’s conditioning, burned into the subconciousness. Not doing it is a sign of lacking skill, lacking concentration, lack of body control and regarded as embarrassing – more so as it simply looks, well, pathetic. 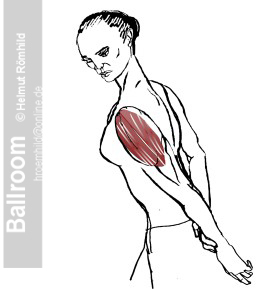 What’s happening on the ballroom floor is not very kind to the dancer’s shoulder. Just the work to carry the weight of the arm can make the shoulder give in. The dancers’ arms are – in addition to being raised – bent and twisted: The lower arm points forward (especially the right one of the gentleman and the lady’s left one), a posture applying torque to the shoulder joint which has to be compensated. Difference in height, a sagging left arm of the lady, lack of posture, insufficient footwork: suddenly the lady’s accelerated body falls into the gentleman’s right arm, suddenly kinetic energy is released and a considerable force is ripping at the shoulder joint. Another very important thing is often ignored: The tendency to lift the shoulder towards the ear and/or to move it forward indicates a physical weakness, wear and tear, or even injury of the shoulder. To work out maintains and improves strength and helps to avoid and even heal injuries. The seemingly effortless way of ballroom dancers to move to the music is a result of considerable fitness. Already the basics of correct posture require strength and an optimised coordination of ligaments, tendons and muscles. Dancing alone is not enough to improve strength and mobility. On the contrary: dancing means to make the system of muscles, tendons, and ligaments work for hours and hours, relentlessly exploiting the individual possibilities and pushing beyond. You have to work out to compensate the demands of your sport and to match your rising aspirations as a dancer. In a short series of articles Ballroom will explain the anatomy involved and discuss exercises to improve mobility, build up strength, and avoid injuries. Fitness Trainer Ute Römhild, Trainer Assistant Marc Moder and model Martina contribute expert knowledge and show how to work out effectively. Incorrectly performed exercises can damage your health! Consult a fitness instructor before starting to exercise and exercise under supervision of a fitness instructor. 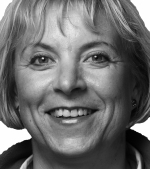 Expert advice is provided by Ute Römhild and Marc Moder. 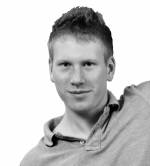 The the pictures were taken at the fitness studio of sportsclub TSV Glinde. We are grateful for the generous support. The reason is that the shoulder joint has little support from the bone structure. Instead a set of ligaments prevents the upper arm from simply dislocating when being moved. The overall stability comes from a system of ligaments, tendons, and muscles which – at the same time – provides the arm’s amazing radius of action. Lifting an arm means that one group of ligaments, tendons and muscles pulls the upper end of the arm towards the body while another group moves the rest of the arm away from it. 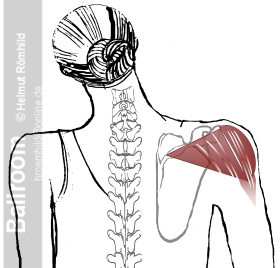 The work of lifting and holding is to a great part done by the big shoulder muscle or delta muscle. easily to identify because it gives the shoulder its characteristic shape. one on top of the shoulder, one in front attached to the collarbone and one in the back attached to the shoulderblade. While starting from different points they all come together at the top third of the upper arm, the place where the lady puts thumb and index finger to connect with the gentleman. and even more important than making the muscle work. Stretching is the main approach to maintain and improve mobility and it even helps to heal injuries. Stretching should become part of the dancers training and is always part of the workout. Pulling the arm forward stretches the back part of the delta muscle. Pulling the arms backward and slightly behind the body stretches the upper and frontal part of the delta muscle. The backward pull has to be done very carefully and without much force: just apply some tension to the muscle and that’s it. Overdoing it can damage the shoulder joint because during the backward pull the arm works as a powerful lever forcing the shoulder joint apart. To maintain and improve strength, the delta muscle has to work. The workout has to be optimised and tuned for the benefit of the involved muscles, but it means basically to contract and to release the muscle. Do not simply raise your arms or elbows. The goal should be to use your shoulder muscle! 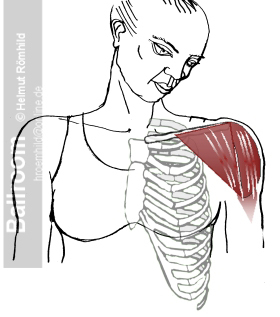 Concentrate on the shoulder, feel the delta muscle contract and expand. The rest of your body maintains stability but is not working. Adjust your upper arms vertically and close to the body, pull your lower arms up to form an angle of 90 degrees. Now only the upper arm works as a lever and moves the arms’ weight or additional dumbbells. Lift your arms until elbow and shoulder are in line (it’s useless to push further) then bring them down again. Workout of the delta muscle means to repeat that sequence, always maintaining the 90 degree angle between upper and lower arm. The same happens when exercising on a machine. The difference between using free weights and the exercise machine is that the machine concentrates all the effort on the delta muscle while keeping the body in an optimal and more or less relaxed position. Forget your arms, it’s your shoulders that count. Working out should raise the awareness of how the body works. Body control means that the dancer not only knows how the arm is lifted and held but also to really use the shoulder muscle. The goal is to ‘tell’ the delta muscle to lift and hold the arm. 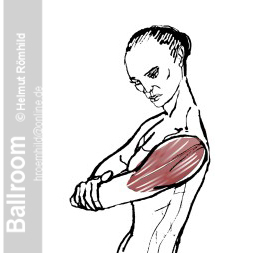 When working out the dancer becomes familiar with how it feels when the shoulder muscle is used. This is the important first step towards a full brain-body feedback which is at the base of body control.